Fontmatrix is a font manager built with the kind of features and abilities graphic designers, layout pros, and others have felt necessary, but modernized with some new touches. Fontmatrix has a concept of ‘tagging'. This makes it really nice to group fonts and even sub-group them logically for use in a book for instance. 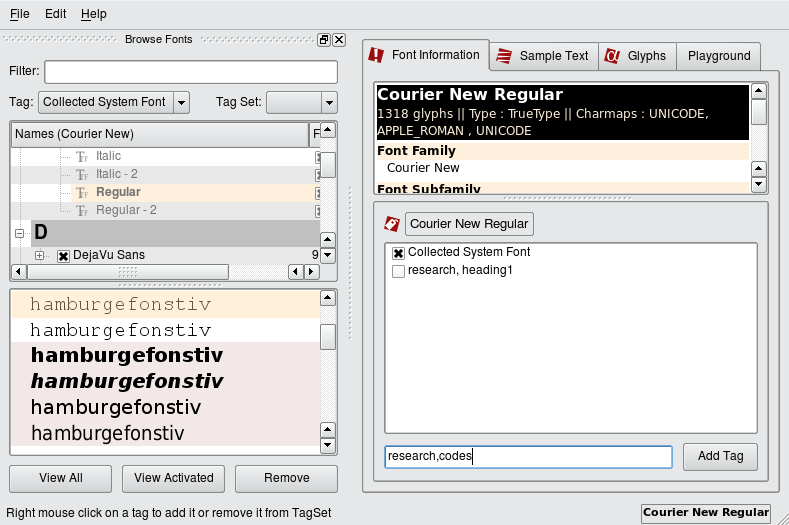 It also has extensive gui support for showing all glyphs in a font, previews of sample text, variable sizing and also tells what kinds of advanced Open Type features are inside each font. These features have never been seen outside of a font editor. And not least, it creates a nice PDF catalogue of user's fonts for printing or reference. In short, fontmatrix is a font manager for professionals, but is nice and user friendly.